Compare Your Briefs Dot Com?? I have to admit to being a regular user of Trip Adviser both before and after holidays. It is an excellent way of finding out about intended destinations and local entertainment. I have left occasional reviews. There have been criticisms that sites like this allow competitors to post negative feedback. But there is always a right to reply and overall, whilst not perfect, it is a useful way of finding out about places. What has this got to do with the law? Well how would we feel about a similar comparison site for Solicitors’ firms. What if you could go to a forum and see what former or current clients are saying about your lawyers? There are some sites around, notably, Solicitors-Info which is growing in popularity. But this whole area could expand if The Law Society goes ahead with plans to develop its own site. This is a response to a report earlier this year from the Legal Services Consumer Panel, encouraging the profession to make greater use of comparison sites. The Law Society already has a Find A Solicitor service which gives basic information. But it has no formal facility to enable the public to see how a firm performs. Would this be a good thing? One danger is that disgruntled opponents could post offensive and misleading reviews. It might even be used by unhappy former clients to ‘sound off’. But that is the world in which we now live. They might sound off somewhere in any event. Other sectors are learning to live with such sites and lawyers will really just be bringing themselves into the 21st Century. If there is obviously inaccurate posting then there would be right to post a response or even remove in extreme cases. And it will do any harm for lawyers to be aware of what clients think about their services and where they could do with improvement. We live in a world where consumers have greater knowledge and expectation then ever before. That can only be a good thing in a modern democracy. The days are long gone when lawyers were remote and expensive or when the family lawyer acted in every matter for generations. Firms need to understand what clients need and expect of them. This would seem to be step in the right direction. But if it does happen and you leave a review – be gentle!! Here’s a question – what would you think if this came up on your twitter timeline? Would you sympathise with the frustration of a delayed traveler or would you see it as a real threat of a terrorist attack? Well to anyone with a bit of common sense the answer is obvious. Sadly that has not been the case for the unfortunate Paul Chambers who tweeted that statement back in 2010. He was charged and convicted of sending a public electronic message that was "..of an indecent, obscene or menacing character contrary to the Communications Act 2003". He was duly fined and ordered to pay the costs. And he does now have a criminal record. But this case really makes our criminal justice system look a bit ridiculous. Would any reasonable person reading those words consider them to add up to a menacing threat? His case has generated a lot of media interest mainly because of the celebrities who have backed him; including Stephen Fry and Jonathan Ross. Let’s hope that the judges see the distinction between the sort of conduct from which we need to be protected and what is really an ill-judged joke! There are many who question the rights and the wrongs of our wars in Afghanistan and Iraq. But regardless of those arguments we all feel for those young men who are sent to fight especially when we hear the dreaded news of another tragic loss. These terrible events seem that much worse when the loss is caused by errors on our own side, where soldiers are killed or injured by their own forces or by inadequate equipment. This is the issue which is being currently before the Court of Appeal. In two separate cases being heard together the Appeal Judges are considering what duties are owed by the MOD to our own forces. Corporal Stephen Albutt was killed in a friendly fire incident where it would appear that forces on his own side were at fault. Privates Phillip Hewitt and Lee Ellis, and Lance Corporal Kirk Redpath were killed by roadside bombs whilst driving vehicles described as ‘inadequate’. The Ministry of Defence argues that it should have immunity from legal actions. It says that if it can be sued for incidents arising in combat then it will be inhibited from effective operations. The contrary argument is that soldiers should be entitled to the maximum care and provision of the best equipment if they are putting their lives at risk for the sake of the state. "The Ministry of Defence continues to argue that British soldiers should be in the uniquely unfortunate position of having no human rights when deployed abroad to fight on our behalf," said Jocelyn Cockburn, one of the lawyers involved in the case. She added: "Their argument reaches even lower depths now in recognising that whilst an Iraqi citizen who is killed or injured by a UK soldier can rely on the Human Rights Act, the soldier himself cannot do so if he is given faulty equipment which leads to his own injury or death." There may be some operational issues to be dealt with. But this cannot be used as a justification for depriving soldiers of justice, especially when they are placing their own lives in danger. It will be interesting to see what view is taken by the appeal judges. But there is surely no place for immunity from accountability in a modern society. Miami 5 - a scandalous injustice? Managing a modern law firm is all about running a business – everything from budgets to human resources to IT. That is of course inevitable and any firm that doesn’t function as a business enterprise is not going to last long. But every now and then something happens to remind us all why we became lawyers in the first place – to fight injustice. That happened last Friday when I met Elizabeth, Olga, Adriana and Rosa; wives of the group of Cuban men known as the Miami 5. This was at a dinner in Liverpool organised by EAD , Unite and Cuba Solidarity . Their story is both tragic and scandalous. For many years from the 1960s there was a series of terrorist attacks on Cuba. These were carried out by right wing exiles in Florida. Several thousand Cubans had been killed and the incidents including bringing down a Cuban plane. They arrived in Florida with the sole purpose of infiltrating these terrorist groups in order to stop the atrocities. But they were arrested by Florida officials, subjected to a trial in front of a hostile Florida jury despite many requests for a neutral venue to secure a fair trial. They were duly convicted and given punitive sentences from many years to life. But the injustice does not stop there. They have been denied contact with their families and the wives have had requests for visits routinely refused. Amnesty International is one of a number or organisations who have campaigned for fair treatment. There is a certain irony that the nation who have led the so called war on terror have imprisoned men whose only aim was to defend their own people from similar attacks. It is also ironic that country who co-drafted the Universal Declaration of Human Rights – described by Eleanor Roosevelt as her greatest achievement – disregards it when it wants to. In particular what happened to the right not to be subjected to degrading treatment or the right to family life? And that is before we start of the unfairness of the trial itself! These men have been the subject of a massive and continuing injustice. It is one that does not attract great publicity because of the power of the USA and its dislike of the Cuban regime. But leaving aside politics it is simply injustice – full stop. But any effective moves to secure their release and fair treatment will have to come from the USA itself and I certainly hope that movements over there will lead eventually to a outcome which is just and fair. I would also encourage as many as possible to support this cause. We are told again and again that motor insurance premiums are too high. We are also told that the reason for this is the number of claims being pursued by ‘no win no fee’ lawyers and in particular claims for whiplash. But there is barely a mention of the conduct on motor insurers themselves. This has been highlighted, this week, by a case where insurers have been battling between themselves over repair costs. In a case known as Coles, Woodhead and Crowther v Hetherton, Guy and Thomas – RSA were taken to task by Allianz and Provident. This concerned the RSA’s practice of using a repair company, MRNM, which is part of their group, to do the work. This obviously saved money on the charges. But they were charging the third parties’ insurers (in these cases Allianz and Provident) a notional repair cost rather than the actual cost. This was based on what it would have cost the driver to do the work rather than what they paid. They accepted that they made money on this arrangement. In a hearing this week the High Court approved the practice and declared that it was entirely reasonable. Mr. Justice Cook ruled that a reasonable repair cost is not necessarily the cost actually incurred. It is now being predicted that in a competitive market other insurers will follow suit. This in turn could see a 25% hike in premiums. This comes on the back of news that the OFT are to investigate the conduct of insurers. They are accused amongst other things of inflating car hire and repair costs by entering into agreements with suppliers who charge inflated amounts. They are also amongst the highest beneficiaries of referral fees. I hope all this will begin to set the record straight. It is easy to blame victims of accidents for high premiums. It is even easier to blame their lawyers who are always cheap targets! But in reality nobody expects the insurance industry give us all a rebate if claims are reduced. Premiums are too high. But the way they are charged is a very complex web. One phrase which is going to become familiar following the government's dismantling of access to justice is ‘litigants in person.’ These will be the claimants who bring their cases to court without any legal advice or representation. This group of litigants tends to have a poor reputation. In many cases this is justified. In the past there have been people who have seen a series of lawyers and been told that they have no viable case. They plough on regardless and can be a drain on the court system pursuing a case that is never going to win. In fairness that is not always the case. There have been many occasions when litigants in person have shown great determination and succeeded where others might have failed. Erin Brokovich was so successful that they made her case into a movie which won Julia Roberts an Oscar! The dismantling of access is two pronged. There are swathing cuts to legal aid. But it is also going to be more difficult to pursue cases on a no win no fee basis. But the cost is not entirely economic. There is also a huge social cost. For every claimant who decides to pursue a case in person there will probably be two more who will be deterred from doing anything because the whole thing is too stressful and intimidating. So we will then the erosion of justice itself. The legislation imposing these cuts is now in force and its effects will begin in April 2013. But the politicians need to be consistently reminded of these costs. It may a long battle but they need to be reminded of the real cost. Life and Death - whose decision? There are times when our courts have to deal with the most difficult issues of life and death. That is certainly the situation in a Case which is before the High Court as we speak. This is the tragic case of Tony Nicklinson. He was an active and healthy businessman until he suffered a devastating stroke in 2005. This has left him with a terrible condition known as ‘locked-in syndrome’. He is paralysed from the neck down and is unable to speak. He can only communicate by blinking or head movements. But he has no intellectual injury and is fully aware of his situation. He does not wish this to continue. He is asking the court to declare that if a doctor assists him in ending his life that such doctor will not be prosecuted. As the law stands it is a criminal offence to assist a person in taking their own life. "Legal arguments are fine but they should not forget that a life is affected by the decision they come to; a decision going against me condemns me to a 'life' of increasing misery." His application is opposed by the ministry of Justice on the grounds that to change the law in such circumstances is a matter for Parliament and not for the courts. This is one of those classic dilemmas which our courts are called upon to resolve. Should a person who is fully competent be able to say – ‘enough is enough’? It is self evident that he cannot take his own life as even that is dependant on help from others. Or should the judges retain the status quo and declare that, despite his clear wishes, it would still be an offence for a doctor to assist him. My own view is that in these extreme circumstances a person’s wishes should be respected. This is not a case of the courts making a decision for him. It is his own choice. But equally it is a massive responsibility for the judges and it would be equally understandable if they left it to Parliament. It will be interesting to see the result. Watch this space..
Nothern Ireland - a legal legacy? 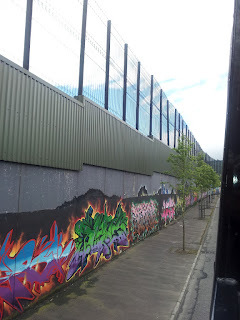 I visited Belfast for the first time last week. It is a city which has seen huge transformation over the last few years. It is modern and vibrant with a growing tourist industry – highlighted by the magnificent new Titanic Centre. 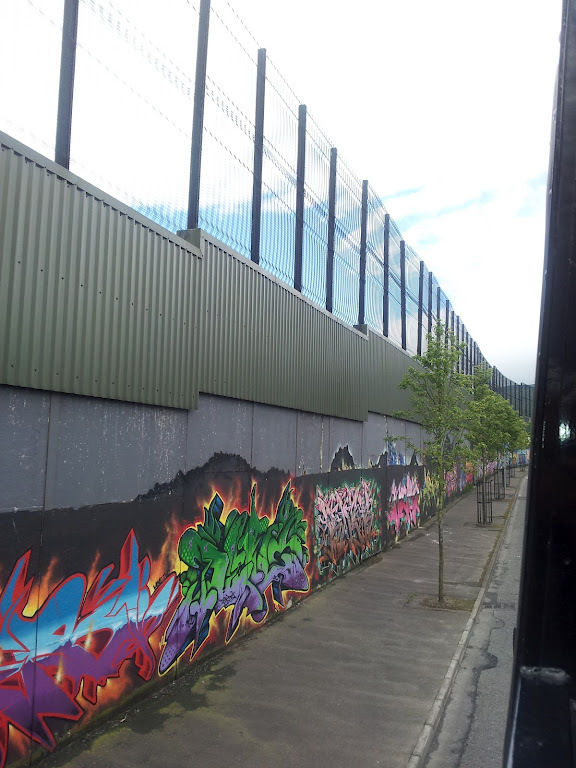 But just a couple of miles from the City Centre, there is a reminder of past troubles particularly with the so called peace line, which is more of a wall, dividing the loyalist communities of the Shankill road area and the republican communities of the Falls Road. But the transformation is remarkable. There is also a sense of unease in certain parts, but I sensed a real commitment to putting the past behind and to move forwards. But the legal consequences are still very much with us. This is particularly highlighted by the release, this week, of a ‘secret’ document from 1972 that followed unsuccessful talks between the UK government and republican representatives. The document talks, chillingly of protecting UK soldiers from legal action if this might inhibit them. "The army should not be inhibited in its campaign by the threat of court proceedings and should therefore be suitably indemnified." As today’s Guardian points out this is likely to lead to new legal claims being brought against the UK government for what now seems to have been a clear policy of immunity from action. Now clearly this all happened at a different time. But this does not alter the fact that governments should be accountable for those affected by their actions even if this does not come to light until many years later. I have always been a big fan of the Bronte sisters and have read everything they wrote. But as well as their writing I have always been moved by the tragedy of their lives. The three famous sisters all died young – particularly Emily (Wuthering Heights) and Ann (Tenant of Wildfell Hall) who both died in their twenties from tuberculosis. In fact in those days a diagnosis of TB was a death sentence. It is now an illness which is very treatable with antibiotics. All of this makes the story of Alina Sarag even more tragic. She was a healthy teenager who became ill in October 2010 following a holiday in Pakistan. She had previously suffered from what is known as latent TB. She attended her local GP surgery on about 9 occasions. When she was finally referred to hospital, her earlier illness was not mentioned. She was seen by a series of medical professionals before she was diagnosed with TB. Tragically it was too late for treatment and she died in January 2011. For so many opportunities to be missed and for a child to die of this condition in 2011 after so many missed opportunities is almost unforgivable. "A diagnosis should have been made and treatment should have been started. I am satisfied that the failure to take action did have a direct causal connection to Alina's death,"
GMC will take disciplinary action against the doctors who failed to refer her. This case also highlights the terrible injustice of removing legal aid in cases like this. After April 2013 it will become extremely difficult for ordinary people to pursue cases like this. It is hard to imagine a case more deserving of justice, or which highlights more clearly the unfairness of the recent steps by politicians to remove access to justice. We could face the double scandal of lives ruined by failings of NHS doctors and those very victims being deprived of justice by the government. I wonder what image you get when you think about a judge. The classic description is pale, male and stale..
Is this a fair image? It certainly was in the past. The judiciary have, in fairness, worked hard to appoint judges from a wider background. Indeed I know many judges who are computer literate, socially aware and know exactly who Gazza was! But there is still work to do. This has been particularly so in relation to the appointment of women and lawyers from ethnic minority groups. In statistics recently published by the Judicial Appointments Commission the number of women applicants recommended for appointment went up from 40% to 56%. That is good news and reflects the fact that the number of women becoming lawyers has caught up with and could soon surpass the number of men. Sadly the number of those from ethnic minorities has decreased from 50% of applicants to just 36%. A fair judicial system has to be representative of the whole of society so this is a disappointment. So does this mean that there have been no male, pale and stale judges who were not up to the job? If a candidate has sufficient experience and ability to apply for a judicial position then they should not be discouraged by a suggestion that they may not be good enough. The need to widen the experience on the bench is paramount. We need a judiciary that is fully representative, in tune with society and also able to perform a highly pressurised job. Let’s hope that applicants from across society feel able to apply and to be welcomed. Virtual Law - friend or foe? One of my regular themes is exploring the future of the legal profession and how law will be practiced in years to come. In previous blogs I have talked about the need for lawyers to be aware of social networking and the power of the internet. The internet could also become the first place that a person might go to look for legal advice – not to find virtual lawyers but to find out what the law is. And there will be no shortage of options. But will they be any good? The article highlights some of the problems of quick online advice. It is normally vague and even occasionally wrong. I remember a client disagreeing with my advice and who supported her views with a copy of the Readers’ Digest guide to the Law. What she had read had no actual bearing on her case at all. It just seemed to say what she wanted to hear. The problem is that this sort of advice can tell you what the law is – provided it is accurate. But it cannot place it in context. It cannot address your particular problem, it cannot advise you of the pitfalls involved in seeking to fight for your rights and it will certainly not be able to tell you the cost. So while wikipedilaw (my invention!!) might be interesting it is no substitute for specific and directly relevant legal advice. Lawyers are highly regulated and have to carry insurance against those rare occasions – well I’m bound to say that - when they get it wrong. This is bound to lead to a huge increase in the numbers of people seeking to bring their own cases. But looking for advice in this way can be dangerous and ultimately costly. Sadly there is no substitute for professional advice. It might be from a lawyer or advice centre but it is certainly worth the effort. Most lawyers I know will give initial help and point you in the right direction at little or no cost. "So get off Twitter. We see you are still on Twitter. We have sent a camera crew to photograph you and your kids and we will post it over the net including Twitter, c**tface. You now have Sophie's Choice: which kid is to go. One will. Count on it c**t. Have a nice day." The judge was close to imposing an immediate prison sentence but suspended its imposition having regard to the Defendant’s age. He will go to prison if he attempts to contact her or other celebrities that he has targeted before. Until recently the internet has been an easy option for bullies. They could fire off their offensive and insulting material from their homes with apparent anonymity. These recent developments and those which I have mentioned before have seen a dramatic turnaround. The message should be clear that anti-social behaviour online is unacceptable and will result in the same consequences as such behaviour in a public place. Politicians are never reluctant to criticise nations with poor Human rights records. As we speak the UK has confirmed that we will not be sending official representatives to the Ukraine as a protest against its treatment of former Prime Minister Yulia Tymoshenko. We are regularly calling on developing nations to improve their human rights records. This is what we would expect from our democratic leaders. This duplicity is raising its head again as the Home Secretary has set herself in confrontation with the judiciary over the Human Rights of offenders. This concerns the right to a family life enshrined in Article 8 of the European Convention on Human Rights which came onto our statute books by way of the Human Rights Act under the last government. She is threatening primary legislation if judges do not follow her view that the right to family life is not absolute. So if a foreign offender has family in this country the government can insist on the right to deport them even if that would mean breaking up a family. Theresa May has said - "This is not an absolute right. So in the interests of the economy or of controlling migration or of public order – those sorts of issues – the state has a right to qualify this right to a family life,"
As I mentioned in my earlier blog, these rights were the product of an Anglo-American initiative after WW2. We should be defending them rather than attacking them. But the proposals are fundamentally flawed, because they will always involve secondary punishment. If somebody commits an offence, it is right they are punished within our sentencing law. But these proposals will involve extending that punishment to the children of offenders. If the government can force a deportation which would remove a parent from a household then the children have to go as well or they have to be separated from their parent. What have those children done to deserve that?Many of them will be UK Citizens. There are reasons for these rights. One is to ensure that governments cannot abuse the rights of innocent citizens. That is exactly what is wrong with this plan. If Mrs. May goes ahead with her threats then we can expect a flood of cases before the courts in this country and in Europe. Whilst one can appreciate that they would be popular with some voters and some tabloids that does not justify them. Eddie Stobart - Jumping on the Legal Bandwagon? 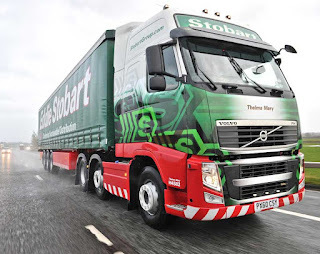 It is almost impossible to drive along any stretch of motorway in the UK without encountering an Eddie Stobart lorry. They appear to be everywhere. But you would not normally associate them with our justice system. Not until now. The Company has a sub division known as Stobart Barristers. They are to offer legal services to the public by offering direct access to barristers in relation to legal disputes. This is something which they are permitted to do under legislation going back to 2004. They say that this will cut out solicitors. They will offer a fixed fee, pay as you go, service which will offer clients certainty and affordable advice. It is tempting to say that they are just jumping on a bandwagon – boom boom! I have joked over the years that some cases are so complex that it would need an Eddie Stobart lorry to deliver the papers to the court. Could we see be-wigged truckers eating Yorkies and preparing closing speeches as they drive from Glasgow to London? But this is in fact a significant and serious development.This is a major household brand which has developed its own relationship with barristers and is now extending this to the public. We are going through a period of unprecedented change in legal services. The advent of Alternative Business Structures means that major names such as RAC and the Co-Op can provide legal advice. Now we have the most well known haulage company offering direct access to the bar and excluding solicitors altogether. It will be interesting to see how this develops. Will clients looking for legal help consider going to this company whose entire identity, however successful, is linked to trucks on motorways? Will cost override all other factors? Or will clients remain loyal to the lawyers they know and love? What this does mean is that no law firm can afford to be complacent. We need a modern and forward thinking approach to ensure that clients are offered the best advice and help possible at a rate and in a way that is accessible and affordable. We all have traffic warden stories! Wouldn’t the world be a better place without them? My worst moment was when a warden in Nottingham gave me a ticket for placing my mother’s disabled badge the wrong way up! And only last week I had to impersonate an aging Ussain Bolt as a warden was in the process of booking me when I was on my was back from the pay machine.. So it must have seemed like Christmas had come early when Aberystwyth in mid-Wales decided to do away with them. What wisdom? What a place to live? After just a year the wardens are back after the parking system seems to have descended into chaos. Cars were regularly parking on yellow lines, in loading bays, in disabled bays and on pavements. Cars were left parked for days on end. Residents began to avoid the Town Centre as parking was becoming too stressful. Who would have thought that traffic wardens would be welcomed back like returning heroes?? Of course the parking laws themselves were not changed. It remained illegal to park in a disabled bay without the badge. But what was lost was the means of enforcing the law. It became a disorganised free for all. Any first year law student will tell you that one of the reasons we have laws is to enable a society to function within a secure structure. But those laws become meaningless if there is no effective means of enabling them to operate. Over the last few months we have seen the most devastating cuts in access to justice in a generation. Legal Aid has been virtually wiped out. Alternative means of funding cases, such as no win no fee agreements, have come under severe attack making them far more difficult to use. We are expecting many people to be derived of legal advice and a huge increase in people having to pursue their own cases. The court service, already stretched, will simply not cope. Many will be deterred from pursuing justice altogether. Any society which does not have equal access to its justice systems regardless of wealth risks chaos. Let the Welsh traffic wardens be a lesson to us all! Bad news for the government in its attempts to effectively abolish Employment Protection. The reason given was that this would stimulate the economy. If businesses can dismiss workers at will then they are more likely to employ more people thus reducing unemployment. Now as a partner in a business employing over a hundred staff I could not disagree more strongly with that argument. I cannot imagine ever deciding to employ somebody just because I could easily get rid of them. That is also the view of the Manufacturing Organization EFF which has spoken out against the plans. In the real world, employers are aware of the need for effective employment relations. They are less interested in the power to sack at will. This is at least some good news for workers in an increasingly hostile environment. The qualifying period before you can go to an Employment Tribunal has gone up from one to two years. There are plans to introduce fees in Tribunal cases which will deter many from pursuing cases. In one sense this was no great surprise. Employment rights have always seen a bit of an ideological ping pong depending who was in power. But abolition of any right of unfair dismissal is clearly a step too far for both workers and employers. Hopefully this poorly thought out plan will now be put to bed for good! I have discussed previously the development of the Virtual Lawyer and how the world is changing at breathless pace. When you think about it, the advantages are obvious. The use of Twitter, Facebook and LinkedIn provides instant communication with clients and potential clients. More importantly it is the way the world is now communicating. The possibilities are endless. Just to update from my last blog on this topic, my LinkedIn page now tells me that my connections link me to a possible 5,293,404 other members. That is about the population of Denmark! And that is just LinkedIn. And they are planning to cross the Atlantic. This will see online activity at a level that we will not have seen before. This is just a taste of what is to come. I think that the days of putting on your best suit for a visit to your lawyer have already gone. So what will a law office be like in 20 or even just 10 years time? Maybe disputes will be resolved via a games platform where the litigant has to negotiate a series of death defying hurdles in order to rescue Princess Justice with all sides agreeing to accept the winner - could be cheaper and more fun! Or will some guru set herself up as @the_judge on twitter and pass down clear judgments in 140 characters. Sound bizarre? Well 25 years ago so did the idea of sending letters via a telephone! But seriously lawyers and their clients have to be prepared for anything. The future is the social network and those firms who do not grasp this could well get a big and rather nasty surprise.